Indian bowlers struck two quick blows to reduce the West Indies to 82 for the loss of five wickets at lunch on the second day of the second Test at the Kensington Oval here today. Ramnaresh Sarwan and Bishoo were the batsmen to be dismissed in the first session as the home team struggled to come to terms with the incisive Indian bowling attack. 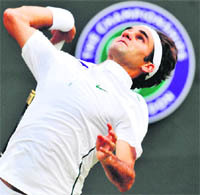 Roger Federer suffered his second straight Wimbledon quarter-final exit when an extraordinary comeback by Frenchman Jo-Wilfried Tsonga condemned the Swiss to a shock 3-6 6-7 6-4 6-4 6-4 defeat on Wednesday. The third seed's defeat was the first time he has lost a grand slam match having been two sets up. India’s search for a foreign hockey coach ended today when former Australian Olympian Michael Jack Nobbs was appointed chief coach for a period of five years. The 57-year-old Nobbs, who was a versatile centre-half, will be at the helm of affairs till the 2016 Olympic Games in Brazil. The ICC on Wednesday deferred a decision on the planned scrapping of the rotational system of presidency but asked next-in-line Pakistan and Bangladesh not to nominate a candidate till a review of its governance structure before the next Executive Board meeting in October. A fiery opening spell from England fast bowler James Anderson allowed Alastair Cook to celebrate his first home match as one-day captain with a thumping 110-run win over a shell-shocked Sri Lanka at the Oval on Tuesday. India didn't have too many right-arm swing bowlers in Test matches of late but Praveen Kumar has been a pleasant exception and could well prove to be an ideal foil for Zaheer Khan during the tour of England, feels former India seamer Manoj Prabhakar. India's quarter-miler female runners Mandeep Kaur and Juana Murmu have been suspended for testing positive for anabolic agents in an out-of-competition test conducted by the International Association of Athletics Federations (IAAF). The Municipal Corporation of Delhi (MCD) succumbed to the sustained pressure mounted by the Delhi Soccer Association (DSA) to reduce the Ambedkar Stadium rental as it decided to revert back to the rent of Rs 500 per day, instead of Rs 5000 per day being charged for the past one year. Manchester United have agreed to sign Spain under-21 goalkeeper David De Gea from Atletico Madrid on a five-year contract, the Premier League champions said on Wednesday. United, seeking to replace retired keeper Edwin Van der Sar, did not provide details of the transfer fee but local media has estimated it to be around 18 million pounds ($29 million). At the break, Chanderpaul and Marlon Samuels were unbeaten with 12 and 15 runs respectively. Earlier, VVS Laxman and Suresh Raina rescued India from an early slump, guiding them to 201 all out before the West Indies struggled to 30 for three in their first innings on the opening day. West Indies trailed India by 171 runs at stumps. India were left struggling at 38 for four, courtesy pacer Ravi Rampaul's three-wicket haul in the pre-lunch session but Laxman (85) and Raina (53) added 117 runs for the fifth wicket to bring the visitors back into the game. Laxman dropped the anchor initially and along with Raina started dominating the bowlers in the afternoon session but West Indies bounced back after tea with Fidel Edwards and Devendra Bishoo taking three wickets each. If Rampaul (3 for 38) was incisive in the first session, Edwards (3 for 56) and Bishoo (3 for 46) were lethal in the final session as India lost their final five wickets for just 34 runs. India did manage to get colour back on their cheeks with three strikes of their own — openers Adrian Barath (3) and Lendl Simmons (2) departed with only five runs on board and left-hander Darren Bravo (9) left with just a delivery remaining for the day's play. All three Indian seamers — Ishant Sharma, Praveen Kumar and Abhimanyu Mithun — picked up a wicket each as West Indies ended the day on 30 for 3. Nothing went right for India at the start as the visitors, for the third straight time in the series, made a score of 200 or thereabout which conveyed as much about the frailty of India's batting as it did about the potency of the home attack. Opener Abhinav Mukund (1) was out to a rising delivery from Rampaul in the second over of the morning which the opener could only lob into the hands of the gully fielder. It followed a run-barren session for the visitors and the only thing happening was the fall of wickets. First Test hero Rahul Dravid (5) was surprised by a Darren Sammy delivery which rose from a length and hard as the batsman tried, it still took the top of his blade to go to the second slip. Indian batsman Suresh Raina was fined 25 per cent of his match fee for a Level I breach in ICC's Code of Conduct on the first day of the second cricket Test against West Indies here yesterday. According to a release issued by the ICC, the batsman was found to have breached Article 2.1.3 of the code which relates to "showing dissent at an umpire's decision by action or verbal abuse". Criticised by the Indian cricket team for his poor decisions in the first Test against the West Indies, controversial Australian umpire Daryl Harper on Wednesday withdrew from the third match starting July 6 at Roseau. 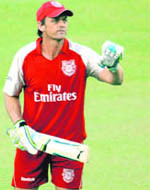 He will be replaced by Englishman Richard Kettleborough of the Emirates Elite Panel of ICC Umpires. The third Test was to be Harper's final match as umpire of the elite panel. Bowling: Edwards 19-2-56-3, Rampaul 16-6-38-3, Sammy 19-4-52-1, Bishoo 14-1-46-3. 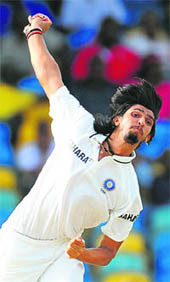 Bowling: Praveen 13-2-32-1, Ishant 10-4-31-3, Mithun 4-1-9-1, Harbhajan 2-0-8-0. “It was just amazing today, I played unbelievable, everything was in," Tsonga said in a televised interview. "That's crazy, he is the biggest champion in my sport, he achieved a lot of things. He is the best player in the world and I'm just so happy to beat him, especially on grass as it is one of his best surfaces." Federer, who had been bidding for a record-equalling seventh Wimbledon title, glided through the first set and never looked in danger in the second set or tiebreak as Tsonga made some sloppy, nervous errors. However, the 12th seed soon found his groove with his immense energy and athleticism suddenly worrying Federer. Tsonga broke for 2-1 in the third and fourth sets and held out thanks to some rasping groundstrokes and trademark volleys. His raw power threatened to completely outmuscle the record 16-times grand slam champion, who failed to raise his game and slipped a break down at the start of the fifth set when he netted. Sania Mirza and her doubles partner Elena Vesnina reached the Wimbledon semifinals after beating N Llagostera Vives and A Parra Santonja of Spain 3-6, 6-4, 7-5 in the doubles event on Wednesday. Fourth seeds Sania-Vesnina, who finished runners-up in the French Open, got the better of Daniela Hantuchova of Slovakia and Agnieszka Radwanska of Poland in the third round on Tuesday. The fourth seeded Indo-Russian pair beat the 13th seeds 6-4, 6-3 in the quarterfinal clash of the women's doubles. Vesnina has one more chance, as she and Indian tennis star Mahesh Bhupathi, seeded fourth, are in the third round of mixed doubles. Nobbs comes in place of Spanish coach Jose Brasa, whose contract was not renewed after the Beijing Asian Games last year. Sports Authority of India Director-General Desh Deepak Verma said here today that the Australian was selected by a committee comprising of officials of the SAI and Hockey India. “Under my chairmanship, the SAI committee and Hockey India unanimously selected Nobbs as our coach for a five-year period up to 2016,” Verma elaborated. The other members included HI secretary-general Narinder Batra, director Anupam Gulati and former Indian captain Pargat Singh, who headed a committee to shortlist the three foreign coaches. The SAI DG said Nobbs will initially get a salary of 10,000 Australian dollars per month, which will be hiked by ten percent if India qualify for the 2012 London Olympics. (The qualifier will be held at the National Stadium in Delhi in February). The hockey coach’s contract carries a performance-based salary hike and he can expect more money, if India perform well in the Champions Trophy and the Olympic qualifiers, and other international tournaments. “His performance will be assessed after every international tournament,” Verma added. Nobbs, who was part of the Australian team for the 1984 Los Angeles Olympics, edged out two other contenders - Jacques Brinkman, who was part of The Netherlands’ Olympic and World Cup winning teams and compatriot Roelant Oltmans - as his coaching strategy was more suited to the Indian needs. “I am very excited, honoured and privileged to get this job”, Nobbs said. After hanging up his boots, Nobbs was involved in grass-root hockey development in Australia and his assertion that he would persist with India’s traditional style of 5-3-2-1, akin to Australia’s style, got votes in his favour of him. Nobbs was of the opinion that it was pointless for India to ape the European style of hockey, which was more of brawn than the skill-based game of the continent. India have been looking for a foreign coach desperately after Brasa’s exit, as Indian coach Harendra Singh, who was at the helm during the Azlan Shah hockey tournament in Kuala Lumpur, could not rise to the occasion as India, the defending champions, finished sixth. Interestingly, Nobbs, who has been coaching the coaches, had learned the finer points of the game from Indian coaches. “I have learnt hockey in Australia from Indian coaches and I want to give something back to India,” he said. He said he was looking ahead, for long-term gains, though his immediate task would be to mould the team for an Olympic berth. "The ICC Executive Board, following the strategic plan that was adopted in April and a firm recommendation from the Governance Review Committee on Wednesday, unanimously agreed to undertake urgently an independent review of the ICC governance structures and processes. "The Board therefore decided to defer the proposed constitutional amendment to the nominations process for election of the ICC president and accordingly withdrew its proposal to the Annual Conference in this regard," the governing body said in a statement after the penultimate day of its annual conference. The ICC Governance Review Committee had recommended that a wide-ranging, independent review should cover all governance-related matters including the possibility of appointing independent directors. "The review will be required to be completed before the next ICC Executive Board meeting scheduled for October. Anderson had been left out of the lineup the last time the teams met over 50 overs, when Sri Lanka romped to a 10-wicket win in the World Cup quarter-finals in Colombo, as he struggled to come to grips with the dead sub-continent pitches. But, back on more familiar ground, there was no stopping for England's main strike bowler as he made sure their total of 229-8 off 32 overs in the first one-day international could not be touched. "I was delighted to get my place back in the side," said man-of-the-match Anderson. "You've always got a point to prove. It was a long winter and we've had a good break and now feel more refreshed. I pride myself on my fielding and it's nice to hold a good one like today." Ashes hero Anderson removed dangermen Tillakaratne Dilshan (1), Mahela Jayawardene (5) and Kumar Sangakkara (4) within the space of 15 deliveries to leave the World Cup runners-up reeling on 15-4. Sri Lanka never managed to recover from the setback and would have suffered an even heavier defeat had it not been for a 52-run ninth wicket partnership between tailenders Lasith Malinga and Suraj Randiv. Tottering on 69-8 in the 22nd over, the duo came together to frustrate the hosts but even their swashbuckling tactics — with Malinga clobbering the only six of the Sri Lankan innings — could only delay the inevitable. Bowling: Malinga 7-0-40-3, Kulasekara 6-1-31-0, Lakmal 7-0-52-2, Jayasuriya 6-0-46-1, Randiv 4-0-34-1, Mendis 2-0-18-1. Bowling: Anderson 5-0-18-4, Bresnan 6-0-26-1, Broad 6-0-32-0, Dernbach 5-0-25-2, Swann 5-0-18-3. "It has been a pleasure to watch Praveen bowl in the first Test. He showed good temperament and I really hope that he is successful in maintaining the consistency in England where he can be very effective," Prabhakar said on Wednesday. Praveen impressed one and all with a match haul of six for 80 in his Test debut, against the West Indies at Kingston. Prabhakar said that Praveen has brought back the art of conventional swing bowling that was missing in right-arm seamers not long ago. DSA secretary Syed Shaheen said here today that the managing committee and affiliated clubs welcomed the MCD decision, which will give a big boost to the activities of the local association. “The soccer fraternity of Delhi feels that this is a step in the right direction as it will help the DSA resume its soccer activity in full steam. The Ambedkar Stadium is the nerve centre of soccer in the Capital, and the DSA will soon start its senior division league,” Shaheen added. Manchester United have agreed to sign Spain under-21 goalkeeper David De Gea from Atletico Madrid on a five-year contract, the Premier League champions said on Wednesday. United, seeking to replace retired keeper Edwin Van der Sar, did not provide details of the transfer fee but local media has estimated it to be around 18 million pounds ($29 million). The club said the 20-year-old had passed a medical this week. "I feel very proud and I can't wait to start playing here," De Gea said on the club website. 'Love-struck' Liz was 'instantly' attracted to Warnie!